Congenital hip dysplasia (also known as developmental hip dysplasia) is related to abnormal hip development that may arise during the fetal life. The abnormalities include hip instability, shallow acetabulum (preluxation), incomplete dislocation of the hip (subluxation), and femoral head not in contact with the acetabulum (dislocation). Involvement of the hip is unilateral but may appear on both. It predominantly occurs in females than in males. It is usually recognized during newborn and responds to treatment best if started before two (2) months of age. Hip dysplasia treatment is dependent on the age of the child and the severity of the condition and ranges from application of a reduction device to traction and casting, to surgical open reduction. Casting and splinting with correction is usually unfeasible after six (6) years of age. 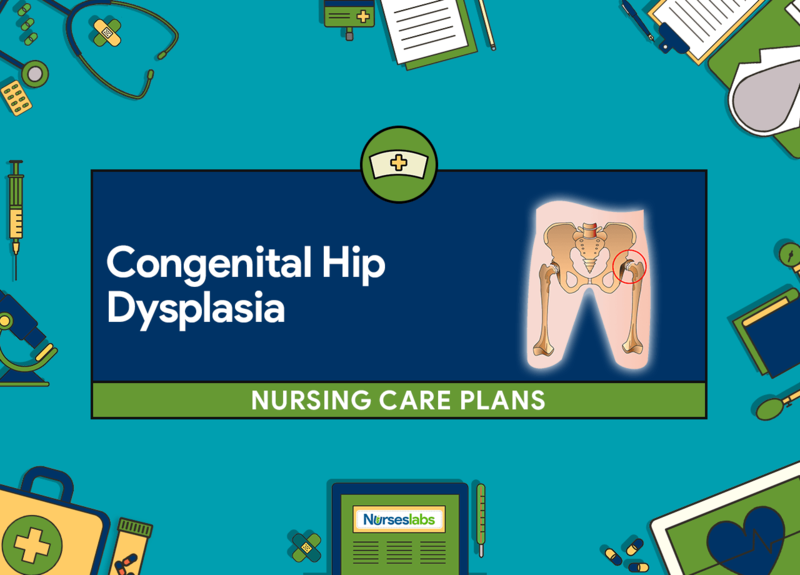 Nursing care planning goals for a child with congenital hip dysplasia include improving physical mobility, providing appropriate family and social supports, educating and involving parents in ADL’s, and avoiding complications (e.g., compartment syndrome). Child will move self in bed with traction bar; walk the length of the hallway and back twice a day. Assess muscle mass, strength, tone; ability to move and activity level in performing ADL. Provides data about the condition and function of the musculoskeletal system. Assess sensory and motor function of extremities; presence of surgical correction of musculoskeletal abnormalities. Provides data about conditions or treatments that affect mobility. Assess activity restrictions, bed rest status, imposed immobility by braces, casts, traction, splints. Keep rest during acute stages to promote healing and restoration of health. Allow all age-appropriate activities that promote mobility, encourage the infant to crawl. Facilitates mobility based on the constraints of illness and provides an opportunity to vent frustration due to imposed immobility. Discourage activity restrictions unless ordered; allow and assist if possible in performing daily activities; administer pain medication prior activity. Supports mobility and activity compatible with health and life; allows for independence and control for normal development. Provide and apply harness, splint; use of aids including wheelchair, crutches, supportive reading, eating, and other aids for ADL as needed. Promotes autonomy and support in mobility and activities. do position changes every two (2) hours or as needed; provide a drawing for the child to follow for position and area to lie in bed. Avoids contractures and physical deformity. Encourage and assist the child in muscle strengthening exercises, passive stretching exercises as appropriate. Conserves muscle strength or prepares for use of mobility aids. Facilitates rest with periods of mobility. Avoids fatigue and maintains energy. Teach parents and child about complications brought about by immobility. Promotes compliance with the program to maintain mobility and understanding of effects of immobility. Teach parents and child to utilize devices or aids for mobility and ADL. Helps safe use of aids and equipment and increased protection.